Matteo Del Fante is married and has two children. He graduated in Economics from Bocconi University in Milan. He has attended specialization courses in international financial markets at the Stern Business School, New York University. He began his career at JP Morgan in 1991 in the Research Department and then held various offices in Milan and London before being appointed Managing Director in 1999. 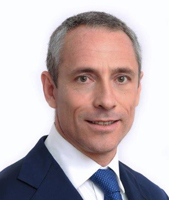 In his last position at JPMorgan he was in charge of EMEA (Europe-Middle East – Africa) Public Sector clients until 2003. In 2004 he joined the newly privatized Cassa depositi e prestiti S.p.A. (CDP) as Head of Finance and M&A, launching in the following years CDP’s Real Estate practice and becoming CEO of the Group’s asset management company in 2009 (CDP Investimenti SGR S.p.A.), where he then took the President office until August 2014. From June 2010 until May 2014 he was Managing Director of CDP. He also served as a Board Member of several companies of CDP Group, including STM Microelectronics (both in STMicroelectronics N.V. – from 2005 until 2008 -, and in STMicroelectronics Holding – from 2008 until 2011-) and in the European Energy Efficiency Fund (EEEF) from 2011 until 2013. From May 2014 until April 2017 he was CEO and Managing Director of Terna S.p.A. , where he held the office of Director on the Board of the Company since April 2008 and was a member of the Control and Risk Committee until May 2014. Furthermore, from June 2015 to April 2017 he served as Vice-President of ENTSO-E, the European Network of Transmission System Operators for Electricity. Since April 2017 is Chief Executive Officer and Managing Director of Poste Italiane and since July 2017 Chief Executive Officer of Poste Vita.